Autostereograms use repeating patterns to trick the eyes into seeing 3D images. You have to get your eyes to look at adjacent versions of the pattern rather than just one copy; the slight variations between the two versions act like the slightly different view each eye would get of something 3D. 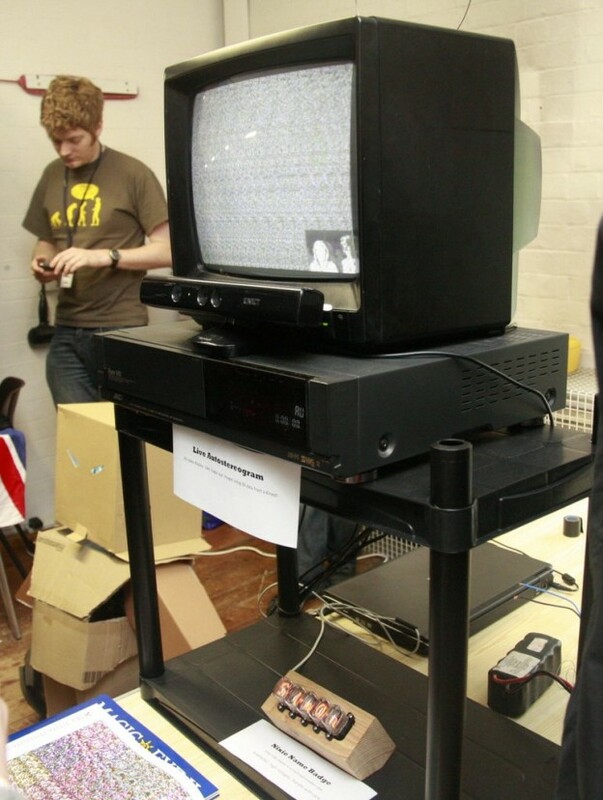 In this case the kinect sitting atop the VCR tells the computer the 3D data of the viewer, which is then played as a live video feed autostereogram to the telly. If the viewer looks carefully at the apparent detuned ‘static’ they can see themselves in 3D. 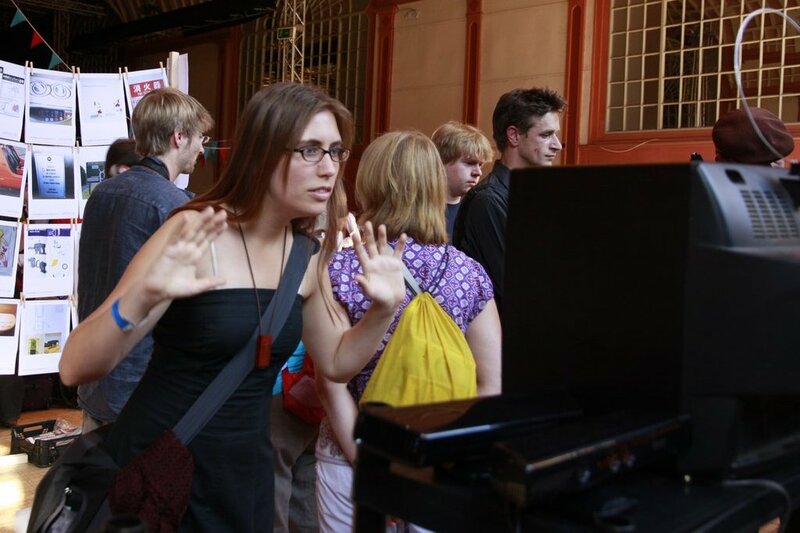 At maker faires this results in people staring intently a detuned telly waving their arms like a lunatic while others look on confused! Magic eye was quite a craze as I was growing up and I remember my dad had a program that could make custom pictures, which I used to impress my schoolmates back when I was 10. When I got hold of a kinect and plugged it into the SDK, the built in depth frame display reminded me of the images we had to input to make an autostereogram, and having realised how much processing you can do at 30fps I figured why keep it static. At the time I couldn’t find anyone who had done this online, though since I have found hundreds, so this mostly mechanical engineer had to code it pretty much from scratch, although Channel 9′s quick start with kinect SDK gave me a good start. Initially I just used a random seed in RGB, and due to the way I programmed it this re-seeded every frame. To my surprise it didn’t seem too epilepsy inducing and actually looked like a detuned analogue telly, which gave me an idea. I greyscaled the code and looked around for a suitable tv. The one I went for was an old 90s sharp TV with an adorable loop aerial. I had had this kicking around from playing N64 at uni. With only antenna input, I had a hard time getting the telly listening to the pc, so it got more oldschool as I had to use my old laptop’s S-Video output and use my dad’s old VCR to modulate the signal to be fit for the telly. The 3D image is a good resolution, similar to what the kinect can achieve alone, allowing the viewer to make out individual fingers of a hand held out in front of them.